No-till agriculture offers vast sustainability benefits. 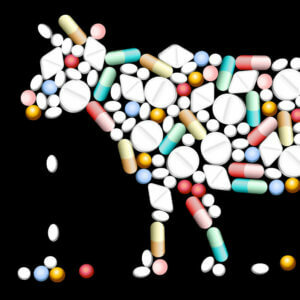 So why do many organic farmers reject it? One of the main images most Americans have of farming is of a plow being pulled by a tractor (or in more antiquated images livestock) turning the land. Technically speaking this act is referred to as tillage: the preparation of soil for planting by mechanically turning it over. 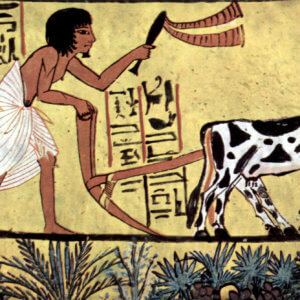 Today, most global farmland is prepared in this way and has been for several millennia. But tillage has many side effects that injure both farmland and the environment. In the push to make farming more sustainable, an increasing number of conservation-minded farmers have turned to what is called no-till agriculture. But the technique is not being universally embraced. Because of the entrenched views of many organic farmers, the group one would think would be most embracing of this tool are shunning it. In contrast, farmers that are growing genetically modified crops are its biggest proponents, and it’s helped contribute to a sizable reduction in the release of greenhouse gases in farm fields. How did this odd situation come about? Tillage is primarily a form of weed control. When a farmer plows, depending on the crop, as much as a foot deep of soil is overturned, leading to a loss of 90 percent of the crop residue (the decomposing plant from the previous year) from the top soil. The benefit of this high turnover is a disruption of the lifecycle of any pre-existing weeds and pests. Tillage is labor intensive, and often a plot of land needs to be tilled several times before planting commences. The practice damages soil and leaves it exposed to erosion, particularly by wind and water. The detriments of tillage were on display during the Dust Bowl (from 1930 – 1939), a time in which severe windstorms and droughts combined with eroding topsoil to ruin crops and farms. This period of hardship for many midwestern farmers have led to some to rethink tillage based farming. No-till farming, a type of soil conservation farming, prepares the land for farming without mechanically disturbing the soil. The previous year’s crops, referred to as the crop residue, are chopped off and left on the topsoil. A no-till planter then only slightly punctures the ground to inserts a seed. To overcome the lost advantages of herbicide and pesticide that tillage bring, safe and effective herbicides are applied to the land before and after planting. There are countess benefits to the land, the farmer and the environment from adopting a no-till system. First and foremost, by leaving the soil mostly undisturbed and leaving high levels of crop residues behind, soil erosion is almost eliminated through no-till farming. The USDA’s National Resources Inventory credits the 43 percent reduction in soil erosion in the United States between 1982 and 2003 to the increase in conservation tillage. The utilization of crop residues in no-till farming also drastically increases water infiltration and therefore retention (i.e. less evaporation) by the soil. This means there is less runoff of contaminated (by fertilizers, pesticides, etc.) water, as well as a reduction in the amount of watering necessary for a given crop. Some estimates suggest crop residues provide as much as 2 inches of additional water to crops in late summer and the Natural Resources Conservation Service states that no-till farmed soils have a water penetration rate of 5.6 inches per hour, twice as much as for conventionally tilled land. This makes no-till farming an excellent opportunity for drought stricken areas like California. Furthermore, because the soil is not being frequently agitated, no-till farming promotes biodiversity in and around the soil. Organisms like mycorrhizal fungi, which make commensal (i.e. benefit both the plant and fungus) associations with crop roots, and earthworms, which increase the water retention of the soil, are allowed to flourish through no-till farming. The farmer also significantly benefits by the adoption of no-till farming, in particular through a reduction in labor. 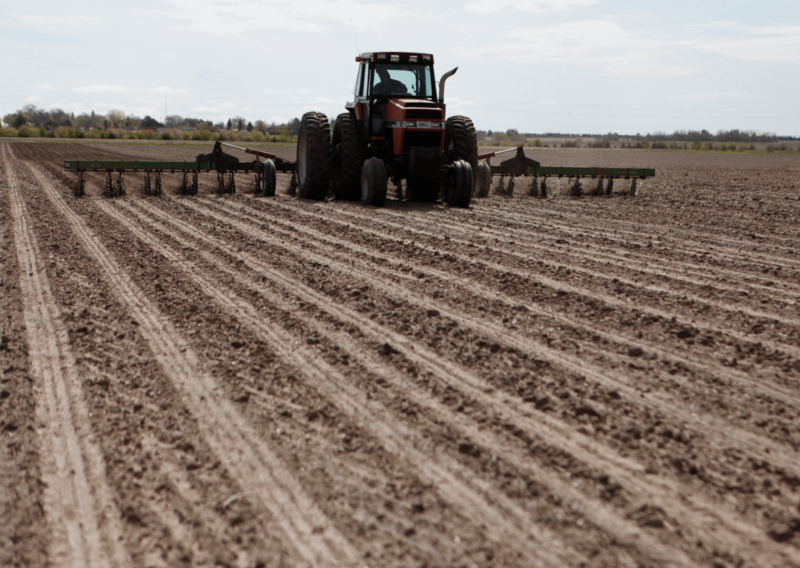 Conventional tillage practices require sometimes as many as five passes over the land with a plow, however, no-till requires just a single pass—to plant the seeds. An estimate by Purdue University calculates that a farmer will save 225 hours of labor per year for a 500 acre farm; the equivalent of four 60-hour work weeks saved a year. Another study estimated a reduction in labor by as much as 50 percent compared to tillage. The benefits in reducing farming’s global warming footprint are immense. Fuel costs saved by running the tractor less, one estimate suggests, no-till can reduce fuel usage by as much as 80 percent. In addition to the reduced carbon emissions from mechanical equipment used in no-till farming, there are several other benefits to the environment. No-till farming, often when paired with crop covering (a technique in which a crop is planted for the express purpose of soil health), reduces carbon emissions through greater sequestration of carbon dioxide by the soil. Over half of the potential carbon sequestration from farmlands comes from conservation tillage. Carbon dioxide isn’t the only greenhouse gas reduced by no-till, the release of nitrous oxide, a very dangerous greenhouse gas, is also reduced through no-till. As more nitrogen is immobilized in the soil there is a reduced need for the application of nitrogen rich manure. Although, the benefits of no-till farming are robust, there has yet to be widespread use of the technique. As of 2009, only 35 percent of U.S. farmland had at least some dedicated land to no-till practices, almost all of it in farms growing GMOs. Furthermore, the USDA reports that no-till practices are increasing at just 1.5 percent and only 10 percent of farms are considered “continuously no-till”. Why haven’t all farmers adopted it? No-till has some drawbacks. For starters some crops need to be planted on tilled lands, such as root crops (e.g. potatoes). There are also obstacles to adopting the practice, in particular start up costs which include new no-till equipment (the planters) and chemical herbicides. A steep learning curve is also an obstacle as no-till practices can breed different pests, infections and weeds than those that are found in traditional till based farming. However, the major argument (often advanced by the organic farm movement) against no-till farming is that it increases the use of chemical herbicides and pesticides. Tilling the land is mechanically biocidal and no till must compensate by using chemicals. “[W]hile these practices can effectively meet farmers’ soil conservation and work reduction goals, they rely on herbicides for weed control, and as such, cannot be directly adopted for use in organic production systems,” writes the Rodale Institute, one of the leading organic research centers and an organization virulently opposed to genetically engineered crops. But this is a simplistic characterization and evaluation of the technique. Scientific advances in agriculture have reduced the need for the dependence on the most toxic pesticides (e.g. organophosphate and carbamate) to humans and replaced them with much safer options. Moreover, the total amount of herbicides is trending down and the total environmental impact due to herbicides has decreased. And the use of insecticides has all but been eliminated, in some instances, with the introduction of genetically engineered Bt crops, which incorporates a natural insecticide that organic farmers have been spraying on their crops for decades. …covering the period 1996–2011, GM traits have contributed to a significant reduction in the environmental impact associated with insecticide and herbicide use on the areas devoted to GM crops. Since 1996, the use of pesticides on the GM crop area was reduced by 473.7 million kg of active ingredient (an 8.9 percent reduction), and the environmental impact associated with herbicide and insecticide use on these crops, as measured by the EIQ indicator, fell by 18.3 percent. 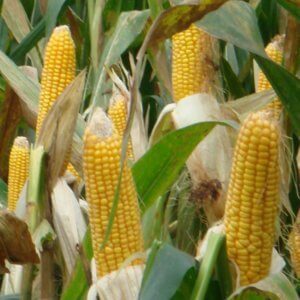 The volume of herbicides used in GM corn crops also decreased by 193 million kg (1996–2011), a 10.1 percent reduction, while the overall environmental impact associated with herbicide use on these crops decreased by a significantly larger 12.5 percent. This highlights the switch in herbicides used with most GM herbicide-tolerant (HT) crops to active ingredients with a more environmentally benign profile than the ones generally used on conventional crops. 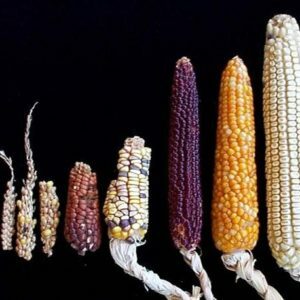 Even with the reduction of harmful chemicals that science has provided, genetically engineered crops represent a way to reduce chemical reliance in no-till farming. A study in the Journal of Agrobiotechnology Management & Economics found that herbicide tolerant (HT) soybeans have aided farmers’ adoption of no-till practices. Furthermore, farms that use both no till and HT soybeans have a significant reduction in chemical herbicide use. There is also evidence that practices like crop rotation and the crop residue themselves can reduce weed germination from year to year. Despite these misconceptions about no-till farming, research into the technique continues and is expanding to many areas of the country. In Washington state, for example, where wheat is grown on fairly arid land, a study into farming of wheat there has shown that no-till matches (and possibly exceeds) yields compared to traditional tillage. Although, we may not be able to convert all cropland to no-till farming, the more we do the better it is for the environment, the farmer, and the land.